“The moon has distinct signatures of water,” top American scientist Carle Pieters confirmed on Thursday. 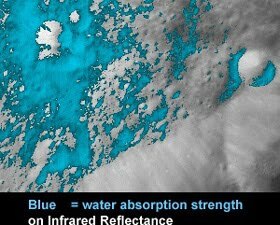 “The evidence of water molecules on the surface of the moon was found by the moon mineralogy mapper (M3) of the US-based National Aeronautics and Space Administration (NASA) on board Chandrayaan-1,” M3 principal investigator Pieters said in a paper published in the journal Science. Amitabha Ghosh, space scientist at NASA, said: “This is a very, very important finding… If somehow water was found on the moon, you could use that water right out there. You could extract it.” “Right now, we don’t know what temperature it is, and whether there is a cost effective way of extracting it,” he added. Mila Mitra, a scientist formerly associated with NASA said: “This is truly significant because it will help find any trace of life on moon.” “Now you will see more money being invested in moon missions. There might be manned moon missions. Now you will see more emphasis on such endeavours,” she added. S Chandrasekaran, another leading scientist, said: “Yes, we are very happy. I was not part of the mission so cannot give technical details but yes, the discovery is very significant. It is great and very important.” Last year, former ISRO chief K Kasturirangan had told the news agency: “For me personally, if Chandrayaan-1 manages to find evidence of water on the moon, then that would be the biggest achievement.” Chandrayaan-1 was India’s first unmanned lunar probe. It was launched by the Indian Space Research Organisation in October 2008, and operated until August 2009. The spacecraft carried five Indian instruments and six from abroad, including M3 and another from NASA, three from the European Space Agency (ESA), and one from Bulgaria. This entry was posted on September 24, 2009 at 6:41 pm and filed under SPACE. You can follow any responses to this entry through the RSS feed. You can leave a response, or trackback from your own site.